Before he passed away in 2004, John Hench, one of the original designers of Disneyland, claimed that the park in California was one of the first examples of virtual reality. “We were doing this 40 years ago,” he proclaimed. It is no exaggeration. Disney was so far ahead of the game when it comes to creating fantasy environments that it now uses VR as a tool to achieve its aims rather than an attraction in itself as it is in some theme parks. Disney specializes in taking your breath away in its parks. Just when you think you’ve seen it all, it ups the ante. One ride sees guests gliding past 3D screens and aiming cannons at them which appear to launch everything from baseballs to custard pies. Unlike most rides this one fights back meaning that you get blasted with bursts of air cleverly timed to the 3D projectiles hurled at the screen. Another attraction is an indoor ride through soaring sets which gives guests the impression they are rats scampering through a restaurant. Super-sized screens are seamlessly integrated into the sets and show images which are so sharp that it’s hard to tell the virtual from the actual. It culminates in a visit to the kitchen where scents are pumped in so you can actually smell the cooking on-screen. Even the shows leave you asking ‘how did they do that?’ Theme park attractions are often said to be immersive but that really is the only appropriate way to describe Star Wars: A Galactic Celebration at Disneyland Paris. The 15-minute son et lumière runs during the resort’s annual Star Wars season at the start of the year and is the closest guests can get to being in the middle of a space battle without actually leaving the earth’s atmosphere. It starts in a suitably cinematic style. As the lights dim, spotlights start to dance across the night sky and a hushed silence falls across the crowd. Tension builds as everyone looks towards a huge tower looming in the distance before a familiar theme tune thunders from hidden speakers. The famous yellow titles of Star Wars are beamed onto the tower and then a technical tour-de-force begins. The tower itself is a nearly 183-feet mock-up of a faded Art Deco hotel containing a drop ride which rockets guests up and down the elevator shafts. During the show it becomes one of the world’s biggest open-air movie screens as scenes from the Star Wars series are projected onto it in time to fireworks which erupt from the roof. Thanks to some technical wizardry, the images appear to be flat even though they are being beamed onto turrets and protrusions. During one scene a huge red banner appears to unfurl down the walls of the tower before it turns into a futuristic cityscape followed by a starfield as the iconic Death Star ominously looms into view. The action spills out onto the surrounding buildings as scenes are projected onto them too but that’s just the start. Lasers in the walls of the tower shoot out in time with the action to make it seem like they are coming from the spaceships on screen. There’s even return fire from the buildings opposite which beam lasers over the heads of the crowd onto the tower. The sound too appears to be coming from all around the audience as speakers are hidden in the surrounding buildings. The effect is so convincing that it seems like the floor is swaying during the scenes where spaceships weave through an asteroid field and down the trench at the heart of the Death Star. Further blurring the lines between fantasy and reality, costumed characters appear at the foot of the tower on a sweeping stage in front of a series of giant video screens showing landscapes from the movies. There’s a parade of sleek white Stormtroopers, uber-villain Darth Vader and his successor Kylo Ren who makes his entrance between plumes of fire which shoot up from the stage. The entire Star Wars gang comes out on stage for the finale when a giant spotlight makes it look like Star Wars’ signature lightsaber is extending from the top of the tower. It takes much more than the wave of a magic wand to pull it off. Behind the scenes there are more than 100 lights hidden on the tower as well as 17 4K projectors, which double project so that there is always a backup ready. There’s also a dedicated team of staff, aptly known as Cast Members due to the role they play on a themed set. The show had its première in 2017 but has been repeatedly upgraded since then. 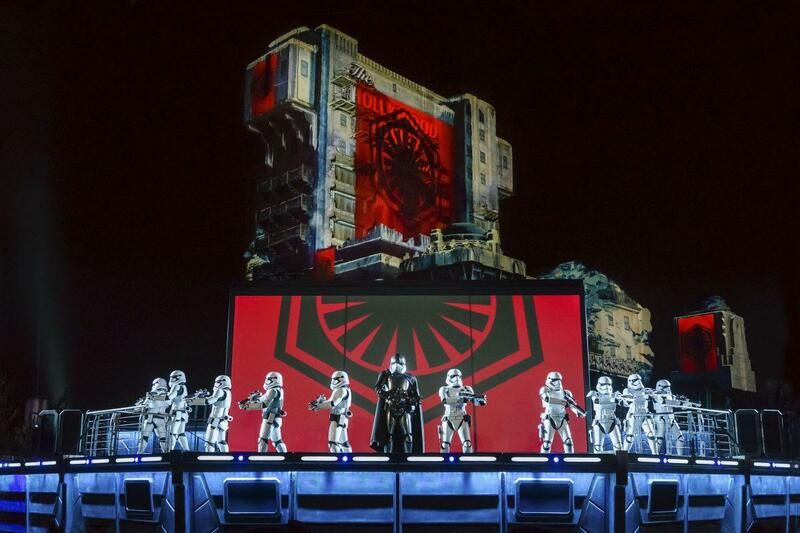 The number of video screens and live performers on the stage has been increased and, crucially, scenes have been added from the new Star Wars movies. This year’s edition came to a close last week and featured footage from the latest instalment in the saga, The Last Jedi, as well as last summer’s spin-off movie Solo: A Star Wars Story. It isn’t as easy as it sounds. The first hurdle is timing. When Disney’s Lucasfilm subsidiary puts a Star Wars movie into production the plot details are a kept closely-guarded secret, even from other divisions of the Mouse. Disneyland Paris came up against this when it launched its Star Wars show and wanted to include a scene from spin-off movie Rogue One. It was offered a stunning sequence featuring an assault on a beach by the enemy’s walking tanks and Tie Fighter spaceships. However, the show designers were kept in the dark about how this fitted into the movie. “As Rogue One hadn’t been released, we knew this sequence was in the movie without knowing exactly what else was going on,” says Berda. “This was created for our tower but all we knew was that it was on this beach which was being attacked.” He adds that the scene for the show was created using Computer-Generated Imagery (CGI) in partnership with Industrial Light & Magic, the division of Lucasfilm which produces the special effects for the Star Wars movies. It was a whole new world. “It is not just video projection, it is mapping,” says Berda adding that Disney pioneered it in France. The objective is creating an image that can be ‘wrapped’ onto the contours of the tower so that it appears to be flat when viewed from below. Instead of trial and error, or experimenting on a miniature model of the tower, Berda reveals that Disney “are using virtual reality. We recreate everything and put glasses on to view it. We built a 3D CGI model of the tower and project on it so we have the real version. He adds that the new scenes have to be approved by Lucasfilm and ILM and creating them isn’t the work of a moment. “I started planning this in July last year,” he says of the latest updates. In recent years Disney has doubled down on VR. Its Accelerator venture capital firm has backed 360 streaming platform Littlstar, 360 video production studio Jaunt and The Void location-based VR arcade. The Void has an outpost at Disney’s sprawling theme park complex in Orlando, Florida and has offered VR games themed to Star Wars and the CGI movie series Wreck-It Ralph. Last year Disney launched Cycles, its first VR short film, and a follow-up is reportedly in the works. Berda expects that the VR system at Disneyland Paris will be put to use again soon as it is likely that a new scene will be added to the show from the next Star Wars movie. It will be released in December with the next edition of the show due to debut the following month. “We are going to of course try to update it as much as we can,” he says. As we revealed, Disney has spent more than $1.3 billion making Star Wars movies since it bought Lucasfilm in 2012 so promoting them on one of its grandest stages seems to be a no-brainer. Berda tells his team that the show “has to be perfect every time because for some guests it’s a once in a lifetime experience. Maybe their kids will be sick, maybe it will be raining or there could be long queues so this could be the only thing they see during the day. It could be the only Disney show they see in their lives so it has to be perfect.” It may seem like an overly high standard but for Disney it’s child’s play. This article was written by Christian Sylt from Forbes and was legally licensed through the NewsCred publisher network. Please direct all licensing questions to legal@newscred.com.